We had only been here four days and I was up to my armpits in whey. Four days recovery time and then I was ready for another adventure. 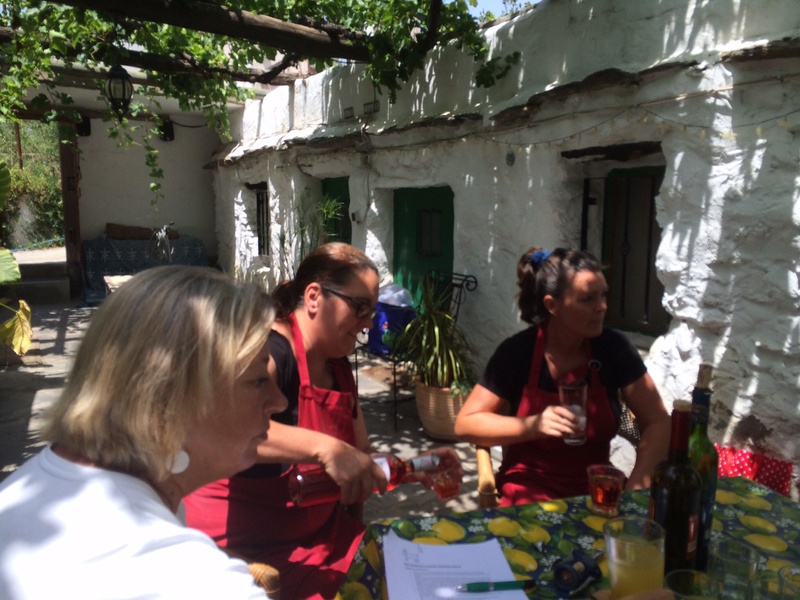 We return to Las Alpujarras – and the area around Orgiva – every year. Call us sad. But we know a good place when we see it! It is also a place that attracts paradox. My friend Carrie and I only seem to be able to meet up here. Even though we both live in the UK. She told me about it and we booked the same day. And what a happy day it was. Hot, companionable, humorous. 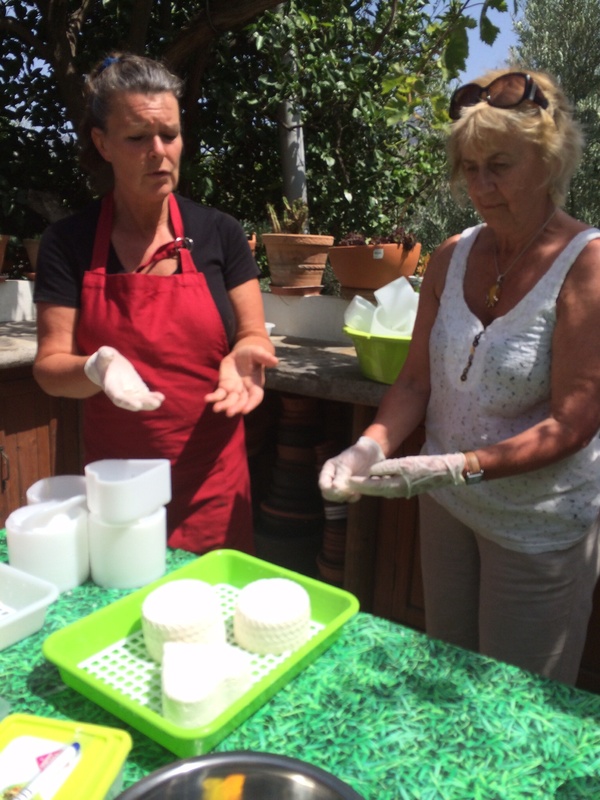 Of the four people on the cheesemaking course run by Sue Halfyard and Tracey Rose (Rosie), one was an artist and the author of a book Carrie had just finished reading the night before – Meg Robinson. One of the cheesemakers, Rosie, is a musician who teaches piano online – a good contact for Alistair. And then there was the magnificent smallholding full of tomatoes, potatoes, garlic, every kind of bean and squash, salad crop and fruit. The smallholding element was just sheer wonderment. So. First buy 55 litres of fresh unpastuerised goatsmilk from your local goatherd. Heat it to 32C and add rennet. Leave for 50 minutes whilst you consume home made lemonade, walnut and maple flatbread and delicious samples of cheese in the coolest of courtyards, shaded by vines. Then return with your compadres (Carrie, Carol from Florida and Meg from her tiny village with 69 inhabitants (equalled only the number of dogs, apparently)) to cut the curds contained in buckets, or what you or I would be using to shift leaves, weeds or in my case, used chicken bedding. 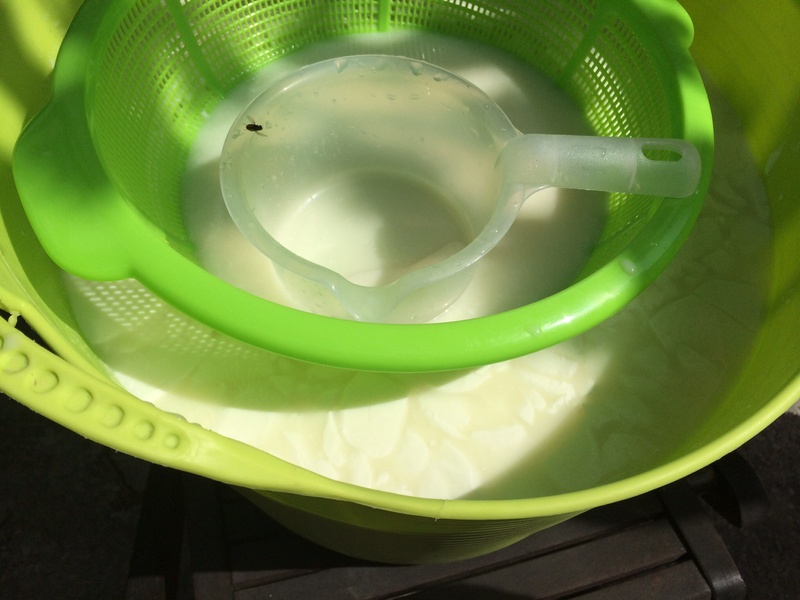 Note to self………… Do not need 55litres of goats milk at home, therefore, only need smaller bowls. Then strain the curds and keep the whey. Press curds into cheese moulds. Retire to aforementioned courtyard for a long lunch prepared by Rosie (musician, smallholder, seed collector, cheesemaker, cook). All I can say is the risotto with tiny tomatoes and courgettes and studded with soft fresh cheese was superb. The pizzas served with the most beautiful salad were to die foe. 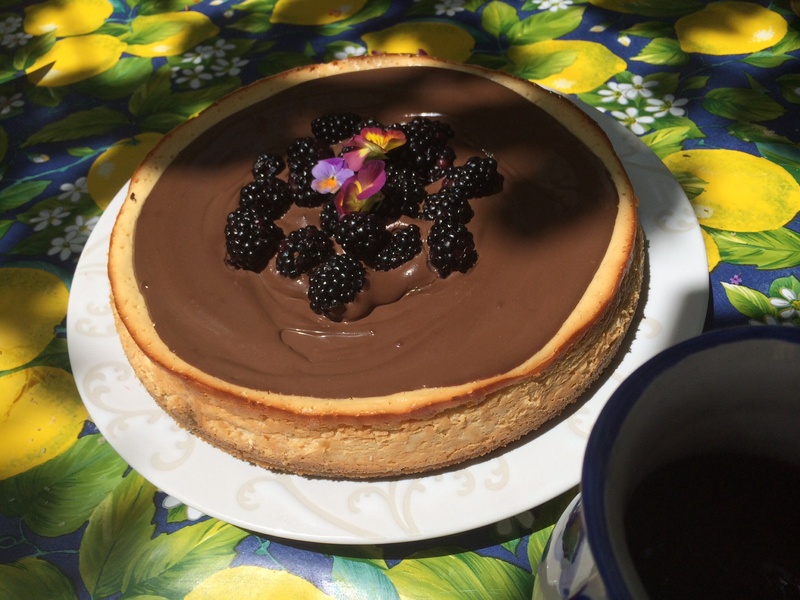 But the pudding – a baked ricotta cheesecake with chocolate ganache and blackberries was by far the best thing I have ever tasted. That and the home made lemon vodka licquer that followed. After an hour or two we merrily returned to our cheeses, released them from their moulds and salted them and packed them into their going home boxes. The cheese can be eaten right now, or dried in the fridge for a few weeks then coated in oil. We returned home with our prize cheeses and 4litres of whey with which to make ricotta. 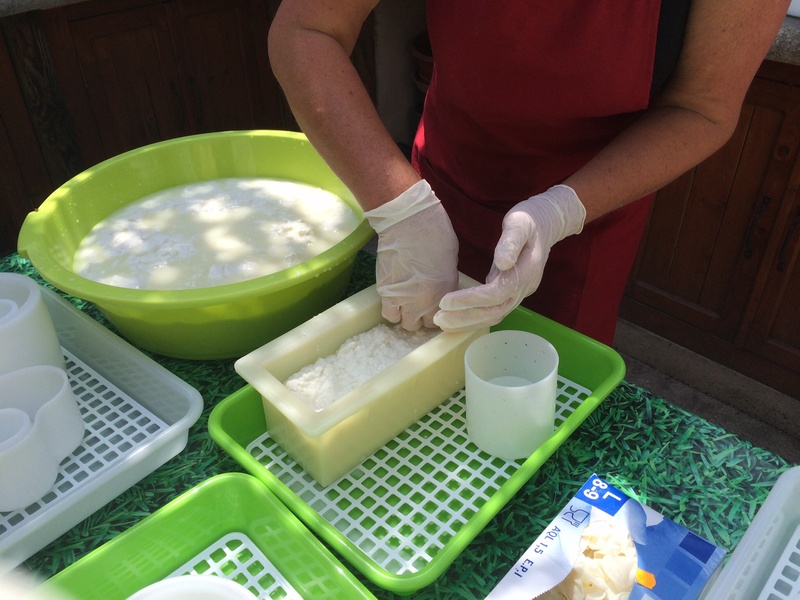 And from they whey following the ricotta making, follows halloumi. And after that the remaining whey makes great plant food. Or you can bathe in it if you wish. Thus ended my first cheesemaking adventure. More tales tomorrow about ricotta and suchlike. At the moment do not appear to be able to post pictures. They will appear later. Since posting this over two and a half years ago, sadly Carrie died in November this year. Our annual trips to Las Alpujarra will now be tinged with sadness, remembering her beautiful soul, her kind voice, her wisdom and the love for this particular region of Spain that we both shared. Whilst there, we would sit for hours at La Cueva de la Luna looking out over the mountains, sometimes finding we had been talking for four or five hours and the food was cold on the plate. Or we would walk in the mountains, or swim, or sit in silence as the night fell and the stars, one by one, appeared in the velvet sky. Carrie was a woman of deep compassion and constantly thought about the world, her family and her friends. She was a loyal friend and a good woman. The ceremony marking her death at Sharpham Trust last week was the most uplifting and moving experiences, perfectly pitched and sensitively drawn. Carrie was there, enclosed in her beautiful felted wool coverlet, laced with twigs and leaves and flowers. And she felt present in spirit. So carefully wrought was the ceremony you felt you could almost turn and see her disappearing round a corner. Remembered with love. Rest in peace mi querido amigo. Besos. Back in the US and so glad to have met you. 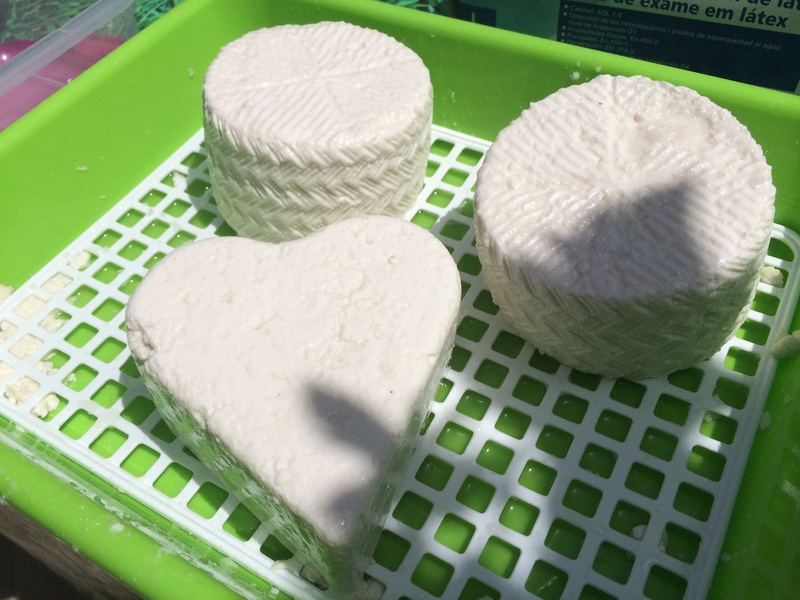 Your write up of our cheese workshop was fabulous and will remain a favorite memory for years to come. After the workshop, I returned immediately back to my brothers home to boil and strain the whey. The resulting ricotta was so good, and the texture; like no store bought ricotta I’ve ever had. My16 year old niece is a testament; it didn’t last long! Hi Carol and happy new year! I have just found your post lurking in the undergrowth of my blogsite – many apologies. It was wonderful to meet you and to spend time with you. Hope we can do it again sometime. Gracias Lilly. Es un placer. Thank you, Dawn, for a lovely write-up. Rosie and I had a fantastic day too – we just love meeting all these amazing people on our workshops. We would love to meet up with you again some time. 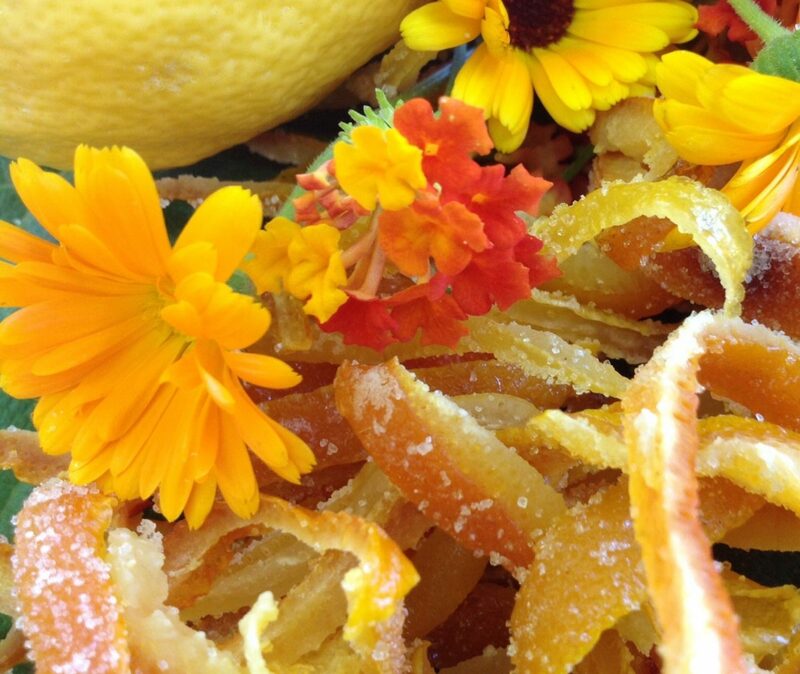 PS Would love the recipe for the candid citrus peel if possible. Thanks Sue, it would be great to meet up again. We are up the mountain till the end of next week then down in El Bancal. Candied peel will be on here later today. Do you have a website I can link this to? Of course, it would be a good idea to meet again once you’re down here in the valley. We don’t have a website yet but it is in progress and we can link you up when it’s done. Thanks Amanda.I am now in the middle of making ricotta from the leftover whey.mAnd candied peel from all the citrus fruit laying around here. Thanks Amanda. We had such fun. I am in the middle of making ricotta at the moment. 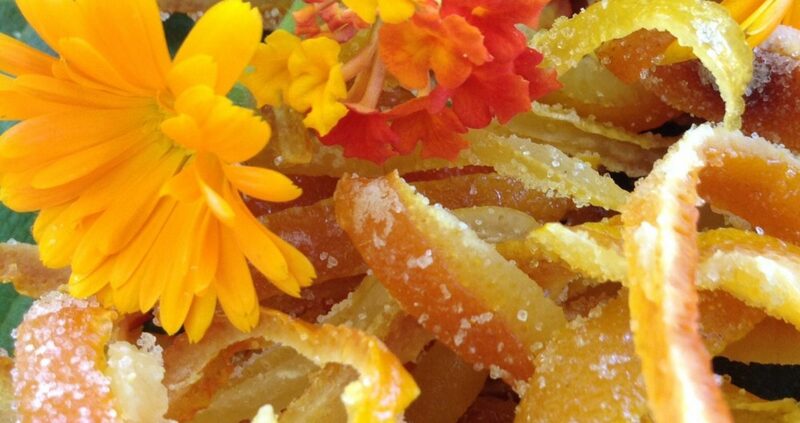 And candied citrus peel…. After all there is more citrus fruit laying on the grass here than you can shake a stick at!